This new flavour is called Apple Burst so is a fruity addition to the range. Inside the pack there are Tic Tacs in two new shades of green, light and dark. The light aren’t similar to the Lime ones in colour, they are aren’t quite as bright as that. There are two tones of flavours too, but to be fair they are quite similar. One of the flavours is a slightly sweet apple and the other is slightly sour version. Both are quite fresh tasting and full on, and start with a strong apple taste, one then mellows and the other leaves a slightly zingy hint. I did quite enjoy this Tic Tacs, and will happily eat up the rest that were purchased. I say “I” but to be honest they are on my desk at work, so they will get a communal picking over from the team too! 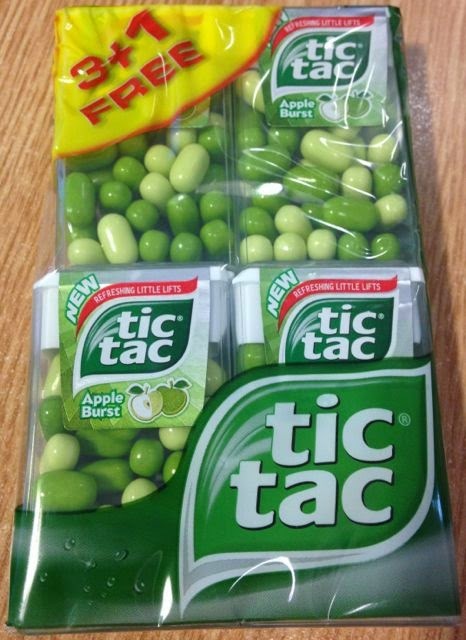 I do like Tic Tacs and it is nice to see a new flavour on the shelves, but apple doesn’t seem that different or special. Nice yes, but certainly not a flavour I’ll be panic buying if it becomes a Limited Edition. We have had some great flavours released in the past, but perhaps the British public don’t really go for them? I think the crazy days of Grape and Lychee are long gone sadly. Grape & Lychee sounds cool, how did I miss those?! These sound nice though, it's great that Tic Tac are keeping the tradition of new flavours alive.